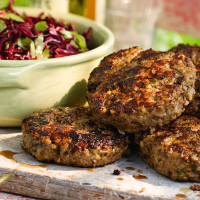 These homemade beef burgers are easy to make and perfect for grilling or barbecuing - a great summertime treat. 1. Preheat the barbecue or light and leave until the flames have died down and the coals have turned grey. Place the bulgar wheat in a small pan, just cover with boiling salted water and cook for about 10 minutes on a low heat until all the water has been absorbed and the bulgar wheat is softened. Set aside to cool. 2. Heat the olive oil in a non-stick frying pan and cook the red onion for about 5 minutes until softened, then stir in the garlic and cook for a further minute. Remove from the heat and leave to cool. 3. Place the mince in a large bowl and add the cooled bulgar wheat, along with the parsley, egg and cooled onion and garlic. Season well. Mix thoroughly together until you have a well combined mixture. Shape into 6 burgers and chill in the fridge until ready to cook. 4. Place all the ingredients for the beetroot slaw in a large serving bowl and toss together well, seasoning with a little salt and plenty of ground black pepper. 5. When ready to cook the burgers, place on the barbecue and cook for about 5 minutes on each side until thoroughly cooked and no pink meat remains. Leave to rest for a couple of minutes. Serve with the beetroot slaw. Cook’s tip: Make sure your burgers are shaped firmly so they stand up well to being turned on the barbecue. And try patting the cooked bulgar wheat dry with kitchen paper to make sure no excess water remains. This recipe was first published in Thu Jun 26 12:31:00 BST 2014.